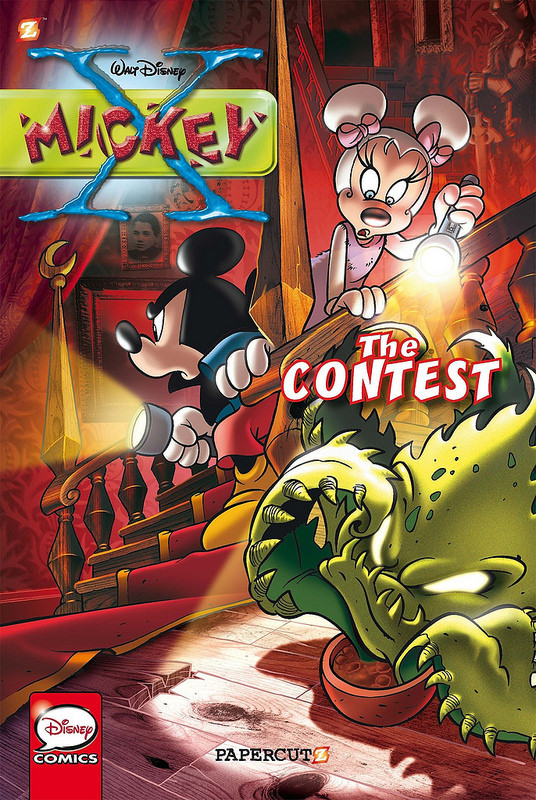 Before reading this comic I had certainly never heard of Mickey X. I’d say that I’m a pretty knowledgeable Disney fan but I suppose I still don’t know all of the spinoffs. The premise for the series seems pretty interesting as Mickey runs errands in a supernatural world filled with dangerous characters. It’s a very different take on the classic characters but one that works pretty well so far and does have a lot of potential. That’s saying something since I feel like the majority of Elseworld tales aren’t very good. At the very least it’s a fun little comic. There are two stories in this comic. The first one is the main adventure as a bunch of mystery authors are invited to a mysterious mansion. The owner may in fact have ill intent as monsters show up and begin attacking the guests. Can Mickey and his struggling author friend save the day or will monsters conquer all? One thing is for sure, someone is going to have to step up and get the job done. I’m always up for an ensemble of mystery authors. Even Detective Conan did something similar in one arc. Goofy (Basically it’s him) can’t write so he has to bluff his way through the meeting. I’d say he does a decent job of it since he has lasted so long without anyone finding him out. Here’s my question though. Since apparently his friend was writing all of the stories for him in the first place, why would Goofy need to go to the bar to get inspiration? It’s not like it would help at all if he simply can’t write. Maybe he was hoping that he could finally write his first book which is a nice thought but I guess it just didn’t happen. Also in case you are ever caught in such a position I’d advise you to at least write something down as opposed to leaving a blank page and conceding defeat. Even if you don’t think the story is great, half a story is better than none. While Mickey is really the supporting character here, he does a good job of keeping up with everyone. You get the feeling that he’s not in too much danger from the monsters due to his speed and reflexes. He comes across as an adventurer in training so I’m sure he’ll get more to do in other volumes. Minnie makes for an interesting ruler since she seems to have abilities here. At the very least, she has a lot of influence and can call the shots whenever she likes. If I had a book that turned my writing into reality, I’d quickly write that my pizza made it on time and was free. I’d probably build some kind of calorie nullifier as well so that I could finally eat all the cheese that I wanted. The monsters that the authors came up with were fairly good though so I’ll give them some kudos on that. They had good imaginations and proved that they were the real deal when it came to author skill. The 2nd story is a whole lot shorter but it’s still pretty good. Mickey finds a camera lying around but whenever he takes a picture there is a door in the background which is slowly opening more and more. He decides not to take any more pictures just in case but it may be out of his hands now. This camera could very well lead to the end of the world! That will weigh heavily on Mickey’s conscience. I figure that behind the door is a specter who haunts the wielder of the camera for all eternity. It makes sense and adds in a lot of tension. However, theories are all that you can make as the monster doesn’t get to appear thanks to the anticlimactic ending. I was expecting a troll moment where a happy character comes out of the door or something, not for nobody to come out. Still, it was a pretty interesting story before that ending occurred. The ending didn’t ruin it or anything, but it was just a missed opportunity. It was short but who doesn’t like an evil camera plot? The art looks pretty good throughout. All of the character designs are sleek and the pages are easy to read with the sharp colors all around. It’s light in detail which helps the overall comic be so comprehensive but naturally more details are always a good thing if handled well. The art is basic but in a good way so I’m definitely satisfied. No real action scenes to test its mettle of course but it’s not like you would expect one here. That’s why it is important that the overall comic looks good. I say the same thing about anime. If it’s not an action series then I feel like it should be very easy to have good animation since the character designs are one of the only things you are focusing on. If you still can’t have good animation then I’m not sure what to say. So Mickey X did a good job with what it was given. Overall, Mickey X was pretty fun. It’s a very short read but one were both stories had a good premise. The first one works quite well while the second’s ending was anticlimactic but they were both solid stories. It’s always good to see more of Mickey Mouse, particularly in his modern design/personality. Hopefully the series got many more comics because I’d be interested in reading those. I’m curious as to where Donald Duck is and what his occupation/personality even is in this version. I’m sure that no matter what he’s doing, he is still the loud and confident character that we are all used to. I’d recommend giving this comic a read and enjoying the best Goofy portrayal that I’ve seen. This entry was posted in Comic Reviews, Comics, Reviews and tagged Alternate Universe, Comic, Comic Review, Disney, Disney Review, Elseworlds, Mickey Mouse, Mickey X, Mystery by dreager1. Bookmark the permalink.